Application containerization with Docker is fast becoming the default deployment pattern for many business applications and Kubernetes (k8s) the method of managing these workloads. While containers generally should be stateless and ephemeral (able to be deployed, scaled and deleted at will) almost all business applications require data persistence of some form. In some cases it is appropriate to offload this to an external system (a database, file store or object store in public cloud environments are common for example). This doesn’t cover all storage requirements though, and if you are running k8s in your own environment or in a hosted service provider environment you may not have access to compatible or appropriate storage. One solution for this is to build a storage platform alongside a Kubernetes cluster which can provide storage persistence while operating in a similar deployment pattern to the k8s cluster itself (scalable, clustered, highly available and no single points of failure). VMware Container Service Extension (CSE) for vCloud Director (vCD) is an automated way for customers of vCloud powered service providers to easily deploy, scale and manage k8s clusters, however CSE currently only provides a limited storage option (an NFS storage server added to the cluster) and k8s persistent volumes (PVs) have to be pre-provisioned in NFS and assigned to containers/pods rather than being generated on-demand. This can also cause availability, scale and performance issues caused by the pod storage being located on a single server VM. There is certainly no ‘right’ answer to the question of persistent storage for k8s clusters – often the choice will be driven by what is available in the platform you are deploying to and the security, availability and performance requirements for this storage. In this post I will detail a deployment using a ceph storage cluster to provide a highly available and scalable storage platform and the configuration required to enable a CSE deployed k8s cluster to use dynamic persistent volumes (DPVs) in this environment. Due to the large number of servers/VMs involved, and the possibility of confusion / working on the wrong server console – I’ve added buttons like this prior to each section to show which system(s) the commands should be used on. I am not an expert in Kubernetes or ceph and have figured out most of the contents in this post from documentation, forums, google and (sometimes) trial and error. Refer to the documentation and support resources at the links at the end of this post if you need the ‘proper’ documentation on these components. Please do not use anything shown in this post in a production environment without appropriate due diligence and making sure you understand what you are doing (and why!). Our solution is going to be based on a minimal viable installation of ceph with a CSE cluster consisting of 4 ceph nodes (1 admin and 3 combined OSD/mon/mgr nodes) and a 4 node Kubernetes cluster (1 master and 3 worker nodes). There is no requirement for the OS in the ceph cluster and the kubernetes cluster to be the same, however it does make it easier if the packages used for ceph are at the same version which is easier to achieve using the same base OS for both clusters. Since CSE currently only has templates for Ubuntu 16.04 and PhotonOS, and due to the lack of packages for the ‘mimic’ release of ceph on PhotonOS, this example will use Ubuntu 16.04 LTS as the base OS for all servers. Note: In production ceph clusters, the monitor (mon) service should run on separate machines from the nodes providing storage (OSD nodes), but for a test/dev environment there is no issue running both services on the same nodes. 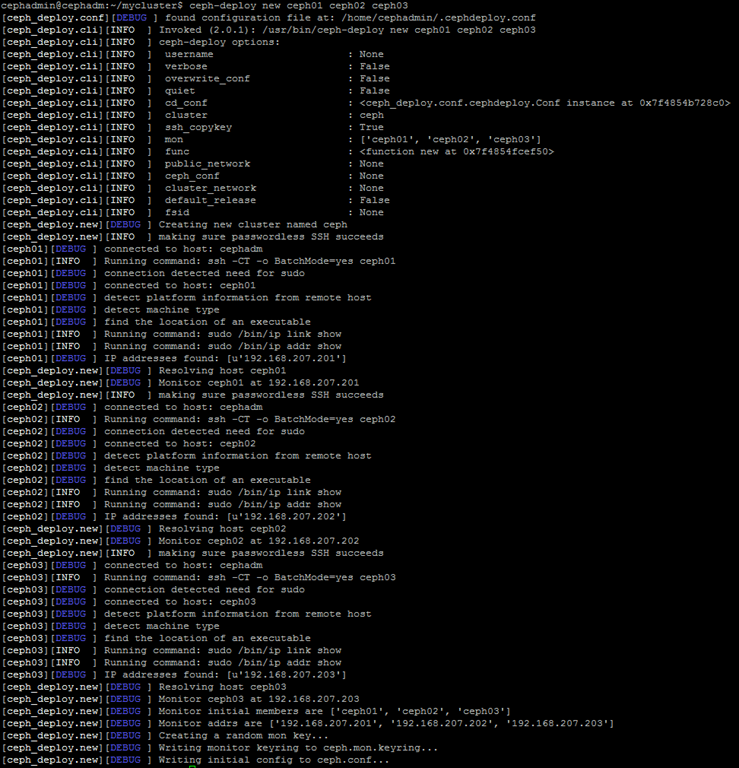 DNS Have a DNS server available and add host (‘A’) records for each of the ceph servers. Alternatively it should be possible to add /etc/hosts records on each node to avoid the need to configure DNS. Note that this is only required for the ceph nodes to talk to each other, the kubernetes cluster uses direct IP addresses to contact the ceph cluster. 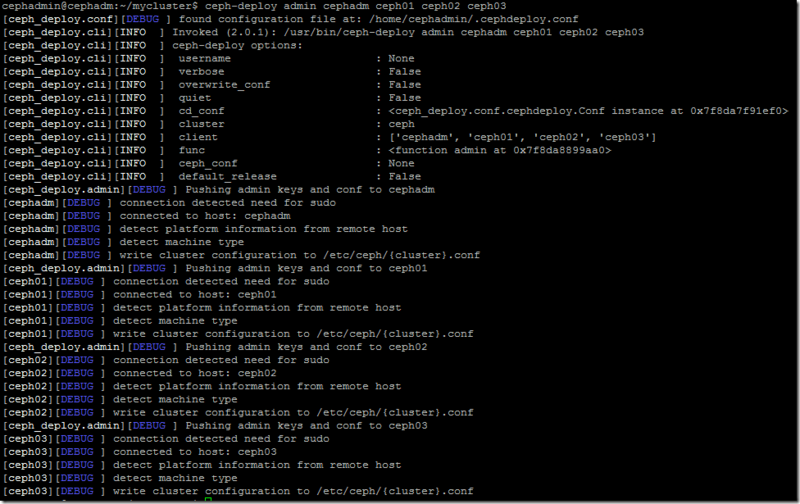 The process below describes installing and configuring a ceph cluster on virtualised hardware. If you have an existing ceph cluster available or are building on physical hardware it’s best to follow the ceph official documentation at this link for your circumstances. The 4 ceph servers can be built using any available hardware or virtualisation platform, in this exercise I’ve built them from an Ubuntu 16.04 LTS server template with 2 vCPUs and 4GB RAM for each in the same vCloud Director environment which will be used for deployment of the CSE kubernetes cluster. There are no special requirements for installing/configuring the base Operating System for the ceph cluster. If you are using a different Linux distribution then check the ceph documentation for the appropriate steps for your distribution. On the 3 storage nodes (ceph01, ceph02 and ceph03) add a hard disk to the server which will act as the storage for the ceph Object Storage Daemon (OSD) – the storage pool which will eventually be useable in Kubernetes. In this example I’ve added a 50GB disk to each of these VMs. Once the servers are deployed the following are performed on each server to update their repositories and upgrade any modules to current security levels. We will also upgrade the Linux kernel to a more up-to-date version by enabling the Ubuntu Hardware Extension (HWE) kernel which resolves some compatibility issues between ceph and older Linux kernel versions. Each server should now be restarted to ensure the new Linux kernel is loaded and any added storage disks are recognised. From now on, (unless specified) use the new cephadmin login to perform each step. Next we need to generate an SSH key pair for the ceph admin user and copy this to the authorized-keys file on each of the ceph nodes. Accept the default path (/home/cephadmin/.ssh/id_rsa) and don’t set a key passphrase. 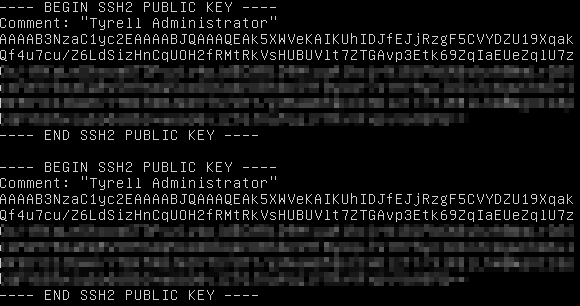 You should copy the generated .ssh/id_rsa (private key) file to your admin workstation so you can use it to authenticate to the ceph servers. If everything is working correctly then each command will return the appropriate hostname for each storage node without any password prompts. You’ll need to resolve any authentication issues before proceeding as the ceph-deploy script relies on being able to obtain sudo-level remote access to all of the storage nodes to install ceph successfully. For some Linux distributions you may need to create firewall rules at this stage for ceph to function, generally port 6789/tcp (for mon) and the range 6800 to 7300 tcp (for OSD communication) need to be open between the cluster nodes. The default firewall settings in Ubuntu 16.04 allow all network traffic so this is not required (however, do not use this in a production environment without configuring appropriate firewalling). 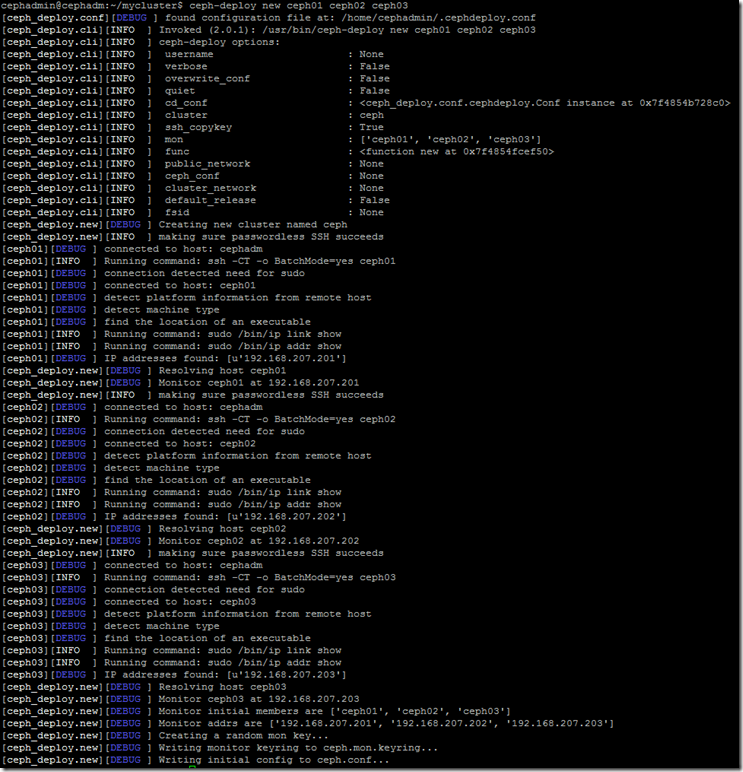 Note: Installing ceph-common on the storage nodes isn’t strictly required as the ceph-deploy script can do this during cluster initiation, but pre-installing it in this way pulls in several dependencies (e.g. python v2 and associated modules) which can prevent ceph-deploy from running if not present so it is easier to do this way. Next again working on the admin node logged in as cephadmin, make a directory to store the ceph cluster configuration files and change to that directory. Note that ceph-deploy will use and write files to the current directory so make sure you are in this folder whenever making changes to the ceph configuration. drwxrwxr-x 2 cephadmin cephadmin 4096 Jan 25 01:03 .
drwxr-xr-x 5 cephadmin cephadmin 4096 Jan 25 00:57 .. This will run through the installation of ceph and pre-requisite packages on each node, you can check the ceph-deploy-ceph.log file after deployment for any issues or errors. drwxrwxr-x 2 cephadmin cephadmin   4096 Jan 25 01:17 .
drwxr-xr-x 5 cephadmin cephadmin   4096 Jan 25 00:57 ..
As you can see, the manager (‘mgr’) service is installed on all 3 nodes but only active on the first and in standby mode on the other 2 – this is normal and correct. The monitor (‘mon’) service is running on all of the storage nodes. As you can see, the 3 x 50GB disks have now been added and the total (150 GiB) capacity is available under the data: section. The two ’30’s are important – you should review the ceph documentation here for Pool, PG and CRUSH configuration to establish values for PG and PGP appropriate to your environment. The easiest way to test our ceph cluster is working correctly and can provide storage is to attempt creating and using a new RADOS Block Device (rbd) volume from our admin node. We can see our volume has been mounted successfully and can now be used as any other disk. Using VMware Container Service Extension (CSE) makes it easy to deploy and configure a base Kubernetes cluster into our vCloud Director platform. I previously wrote a post here with a step-by-step guide to using CSE. First we need an ssh key pair to provide to the CSE nodes as they are deployed to allow us to access them. You could re-use the cephadmin key-pair created in the previous section, or generate a new set. As I’m using Windows as my client OS I used the puttygen utility included in the PuTTY package to generate a new keypair and save them to a .ssh directory in my home folder. If you do not make this change this you won’t be able to authenticate to your cluster nodes once deployed. If we had multiple VDCs available, we need to select which one is ‘in_use’ (active) for deployment of our cluster using ‘vcd vdc use “<VDC Name>”‘. In this case we only have a single VDC and it’s already active/in use. 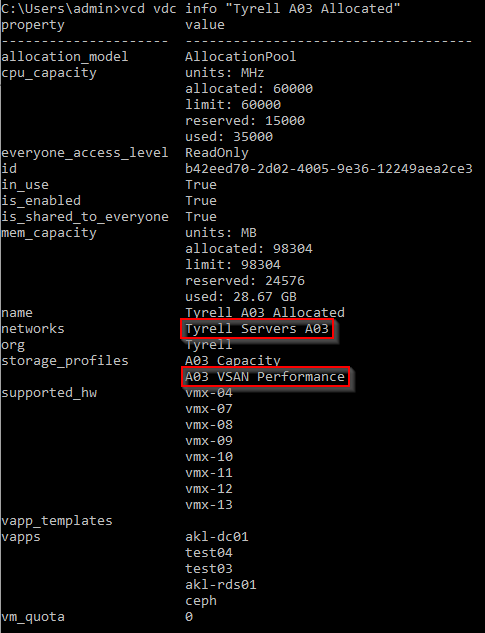 We will be using the ‘Tyrell Servers A03’ network (where our ceph cluster exists) and the ‘A03 VSAN Performance’ storage profile for our cluster. Next we need to update and install the ceph client on each cluster node – run the following on each node (including the master). To do this we can connect via ssh as root using the key pair we specified when creating the cluster. You should now be able to connect from an admin workstation and get the nodes in the kubernetes cluster from kubectl (if you do not already have kubectl installed on your admin workstation, see here for instructions). 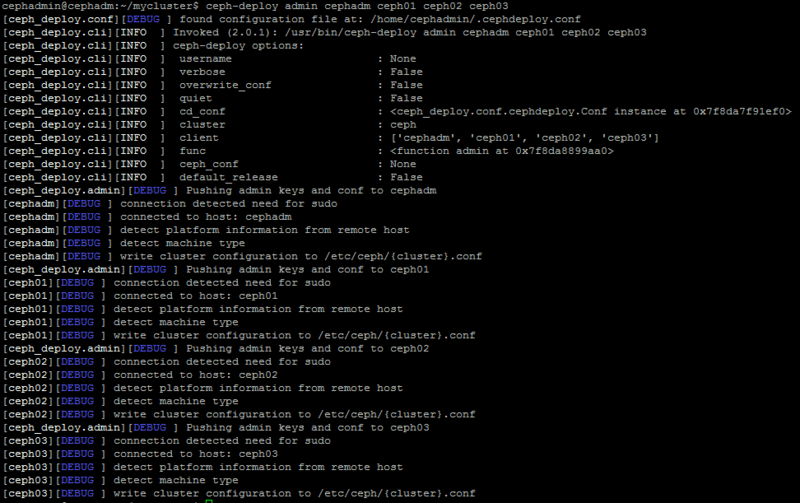 Note: if you expand the CSE cluster at any point (add nodes), you will need to repeat this series of commands on each new node in order for it to be able to mount rbd volumes from the ceph cluster. If not, manually copy the /etc/ceph/ceph.conf and /etc/ceph/ceph.client.admin.keyring files to each of the kubernetes nodes using copy/paste or scp from your admin workstation (copy the files from the ceph admin node to ensure that the rbd_default_features line is included). Note: If the rbd map command hangs you may still be running the stock Linux kernel on the kubernetes nodes – make sure you have restarted them. Now we have a functional ceph storage cluster capable of serving block storage devices over the network, and a Kubernetes cluster configured able to mount rbd devices and use these. In the next section we will configure kubernetes and ceph together with the rbd-provisioner container to enable dynamic persistent storage for pods deployed into our infrastructure. This will return a key like ‘AQCLY0pcFXBYIxAAhmTCXWwfSIZxJ3WhHnqK/w==’ which is used in the next command (Note: the ‘=’ sign between –from-literal and key is not a typo – it actually needs to be like this). remote: Enumerating objects: 2, done. remote: Counting objects: 100% (2/2), done. Receiving objects: 100% (63661/63661), 113.96 MiB | 8.97 MiB/s, done. Resolving deltas: 100% (29075/29075), done. Now we can create our kubernetes Storageclass using this storage ready for a pod to make a persistent volume claim (PVC) against. Create the following as a new file (I’ve named mine ‘rbd-storageclass.yaml’). Change the ‘monitors’ line to reflect the IP addresses of the ‘mon’ nodes in your ceph cluster (in our case these are on the ceph01, ceph02 and ceph03 nodes on the IP addresses shown in the file). Normal  Provisioning           3m    ceph.com/rbd_rbd-provisioner-bc956f5b4-g6rc2_1f37a6c3-22a6-11e9-aa61-7620ed8d4293  External provisioner is provisioning volume for claim "default/testclaim"
As we can see, our test claim has successfully requested and bound a persistent storage volume from the ceph cluster. Wow, this post ended up way longer than I was anticipating when I started writing it. Hopefully there’s something useful for you in amongst all of that. I’d like to thank members of the vExpert community for their encouragement and advice in getting this post written up and as always, if you have any feedback please leave a comment. Time-permitting, there will be a followup to this post which details how to deploy containers to this platform using the persistent storage made available, both directly in Kubernetes and using Helm charts. I’d also like to cover some of the more advanced issues using persistent storage in containers raises – in particular backup/recovery and replication/high availability of data stored in this manner.